With research still needed about the impacts of marijuana use, health care providers can expect questions from patients about safe use for medical and recreational marijuana. CDPHE released the Marijuana Pregnancy and Breastfeeding Clinical Guidance Document for Colorado Health Care Providers in March, 2015. This document provides evidence-based guidance for Colorado health care providers to talk with patients about marijuana exposure during pregnancy and breastfeeding. It was developed using the information from the systematic literature review conducted by the Retail Marijuana Public Health Advisory Committee. Content was developed by a committee of experts with additional input from health care provider focus groups. The final guidance document was tested at several health care facilities in Colorado. Also available is the Marijuana and Your Baby factsheet. 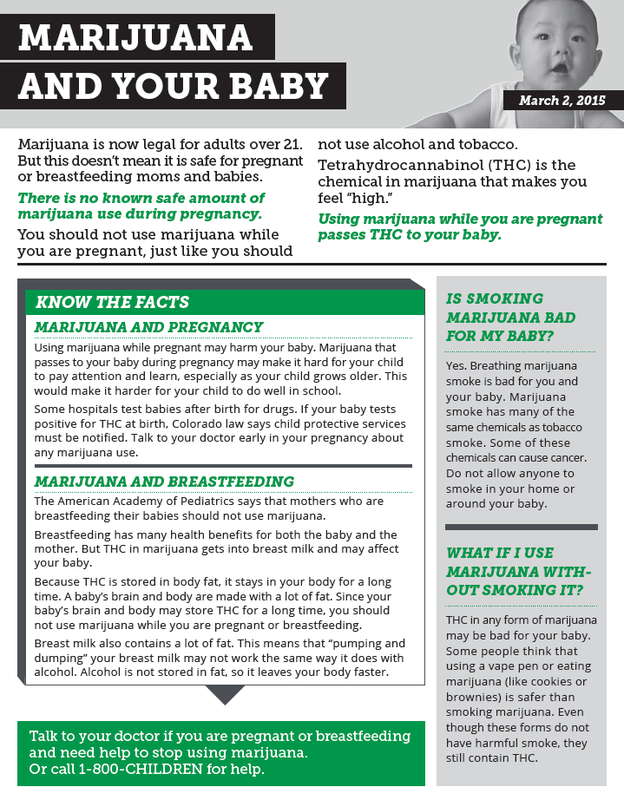 It contains information for patients about the risks of marijuana use during pregnancy and breastfeeding, including health effects, legal issues, safety and available resources. This factsheet is written at a middle school reading level and will be translated into Spanish soon. The factsheet has space on the back for local agencies to place their logo and contact information, if desired. This is Very interesting post.Thaks you for this post a comment.